Think of this as the flip side of The Shape of Water. 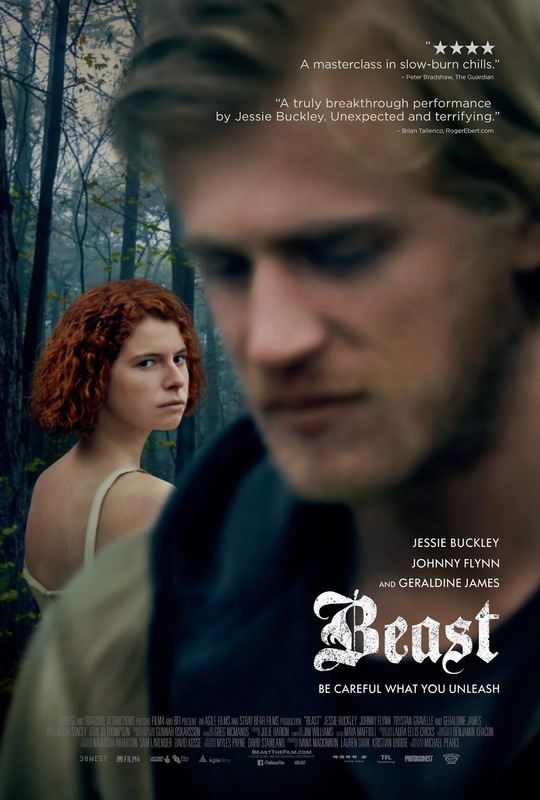 One the most unusual films released so far in 2018, Beast is also one we won't soon forget. Set on the gorgeously lush wood, cliff, and edge filled channel island of Jersey where you can run but you can't hide, the first feature-length effort from BAFTA nominated writer/director Michael Pearce is a heady mixture of Gothic realism, fairy tales, and '60s French movies. And right from the start of Pearce's seven year in the works passion project we feel the influence of early Truffaut, Chabrol, along with Knife in the Water era Polanski when cinematographer Benjamin Kracun's wild, constantly moving camera makes its way to multiple shrines which have been erected to remember the places where young girls of Jersey have lost their lives. Breaking the reverie of island beauty, we not only realize that a killer is on the loose but as a matter of course also begin to suspect everyone in sight. 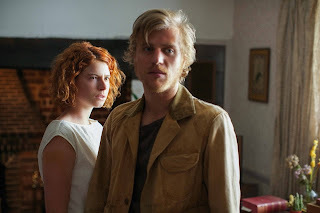 And the paranoiac tension that follows goes a long way toward getting us to the right frame of mind to meet Jessie Buckley's enigmatic twenty-seven year old main character, Moll. Although she conveniently uses the excuse that she still lives at home to help care for her aging father, we quickly find that there's much more going on with Moll (and her family) than meets the eye. And this becomes truer than ever once enough breadcrumbs have been dropped for us to uncover a violent incident in Moll's past that occurred when she'd been roughly the same age as the girls of Jersey's countryside who lost their lives. Add to the mix a menacing Geraldine James as a mother who uses her history of emotional unrest to exert a choke-hold on her daughter and a sister who selects Moll's birthday as the perfect time to make a huge personal announcement and it's easy to see why Moll runs off into the night. In borrowing some of the film's key elements from Little Red Riding Hood among other fairy tales, our redheaded heroine is soon rescued from a would-be attacker by Pascal (Johnny Flynn), a handsome huntsman whom she's quick to not only bond with but cover for at a checkpoint, despite the fact that each recognizes the other is either withholding info or telling a lie. But it's merely the first sign of a new rebellion that begins to take hold for Moll. Tired of living life like the killer whales of her childhood obsession who – as she revealed in an introductory voice-over – must always keep smiling or risk insanity, once Moll meets Pascal, she starts testing the tether of her family's leash and gives up that fake smile. Gradually moving further away from the life she's always known to be with the wild stranger who saved her life, after yet another girl is found dead and Pascal becomes the number one suspect, Moll is forced to ask herself just who it is she can really trust (herself included) and how much. Nobly avoiding easy answers, in an intelligent, psychologically gripping narrative, Pearce gives us the opportunity to watch events unfold through Moll’s eyes while at the same time making sure we're completely aware our leading lady is nothing if not an unreliable narrator. And in an even more intriguing twist, once she revisits the gaps that exist within her own memories as well as her own history and tendency toward violence, Moll questions her own culpability – almost more than she does with Pascal. Reminiscent in spirit to Heavenly Creatures, thanks to a commanding, feral performance by Jessie Buckley whose scenes with the equally magnetic Flynn are filled with goosebump inducing energy, Pearce's sophisticated Beast adds a much needed female charge to the character driven thriller genre. An auspicious feature filmmaking debut in the same vein as Blue Ruin and Cold in July, similar to the way that it ratchets up tension, Pearce's sleeper is sure to attract more attention as the year progresses when we discover that – much like last year’s Shape of Water – there aren't too many fish, beasts, killer whales, or Gothic fairy tales like this in the sea.